Fox News is reporting this morning that winds of up to 80mph are expected today in Southern Cal, with no rain in the forecast for the next week. Pray for Southern California. -W.E. LOS ANGELES — With thick plumes of smoke, towering flames and mass evacuations, a fast-moving wildfire struck one of America’s major cities on Wednesday. As fires raged out of control across Southern California, a new blaze erupted in the Bel-Air neighborhood of Los Angeles, near iconic landmarks like the U.C.L.A. campus and the Getty Museum, home to old masters paintings and ancient Roman statues. It burned up to the edges of the 405 freeway, the nation’s busiest highway carrying about 400,000 vehicles a day, where the northbound lanes were closed for much of the day and commuters drove through a shower of ash with flames rising in the horizon. 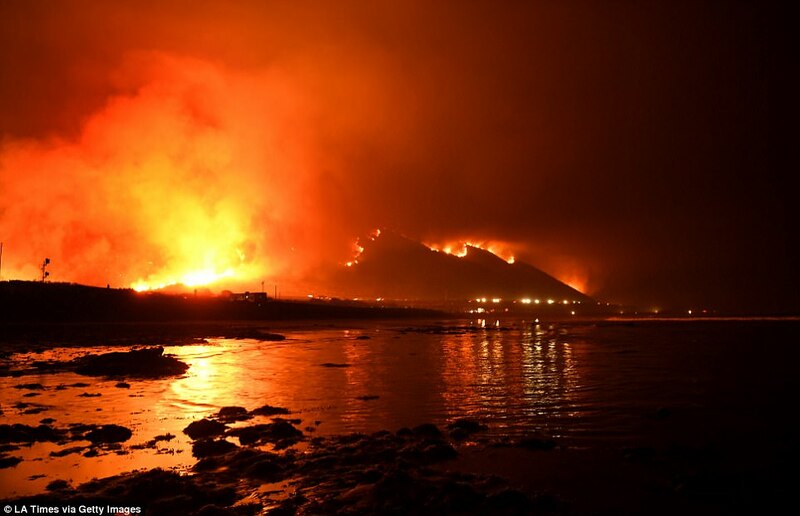 Forty miles to the northwest, the largest of several fires underway had consumed 90,000 acres by Wednesday night and at least 150 structures — probably hundreds more, fire officials said — and threatened 12,000 others in the city of Ventura and neighboring communities, and was 5 percent contained. Other major fires were burning in the northern San Fernando Valley and the rugged region north of Los Angeles. 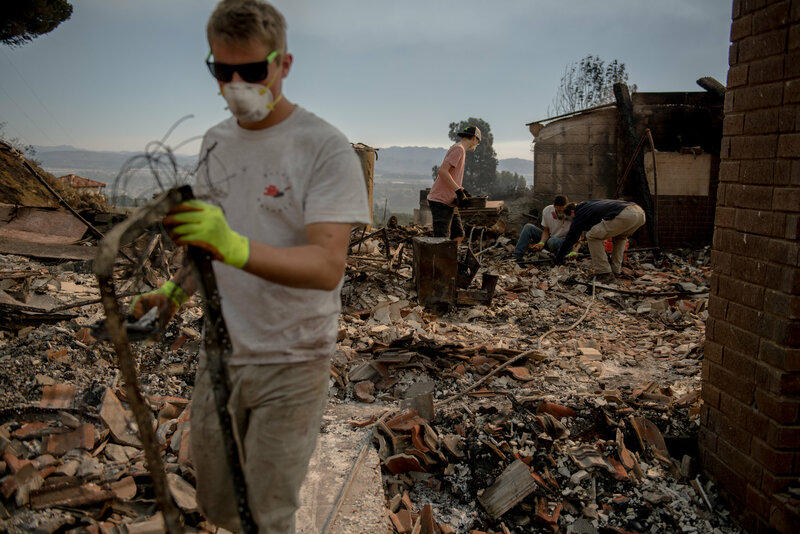 The fires compounded the suffering of what has already been one of the state’s worst fire seasons on record, including the blazes that ravaged the wine country north of San Francisco in October. The new outbreaks have forced nearly 200,000 people in the Los Angeles and Ventura areas to evacuate, officials said, and extremely high winds are likely to make matters worse on Wednesday night and Thursday. Fire season usually peaks in October in California, but officials suggested that with climate change, more fires are occurring later in the year. It was a day in which smoke from the fires ringing the region could be spotted from the Santa Monica Pier, the streets of downtown and the beaches of Santa Catalina Island. And in a city where residents live outdoors, many stayed home to avoid the foul air. By Wednesday evening, the fire in Bel-Air consumed at least 475 acres and a handful of structures, small figures compared with some of the other blazes. But in such a densely populated area, the prospect of warm, dry Santa Ana winds whipping the flames into other neighborhoods had many residents of Los Angeles’ west side preparing for possible evacuation. Officials ordered 700 homes in Bel-Air evacuated. A gray-brown pall, tinted orange in places, hung across a region that is home to millions of people, and the regional air quality agency warned that the air posed a health hazard in places. At least four houses burned in hilly Bel-Air, where sprawling villas costing tens of millions of dollars are home to celebrities and other wealthy Angelenos. Winds could still reach 80 miles per hour, said Chief Ken Pimlott of Cal Fire, the state firefighting agency. “These will be winds where there will be no ability to fight fires,” he said. 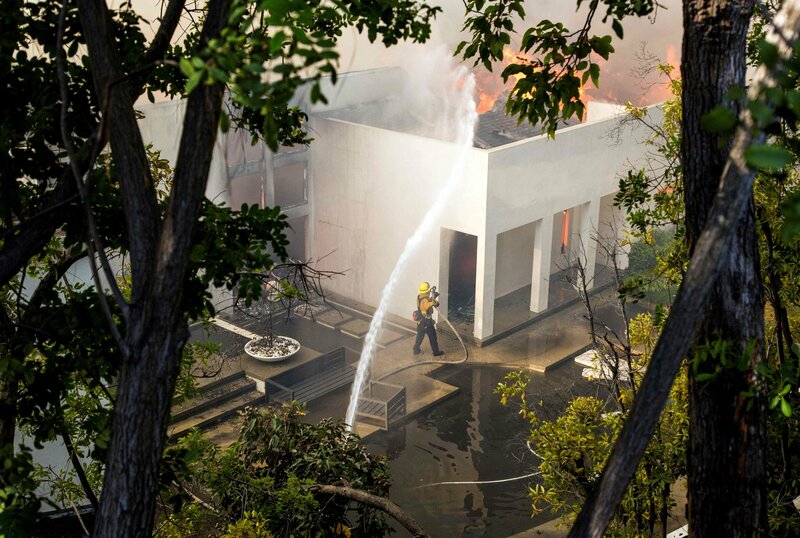 Wind blowing from the northeast raised fears that the fire could jump the freeway, into the area around the Brentwood neighborhood and where the sprawling Getty sits on a hilltop overlooking the 405. • The fires in total destroyed more than 300 homes, businesses and other buildings. 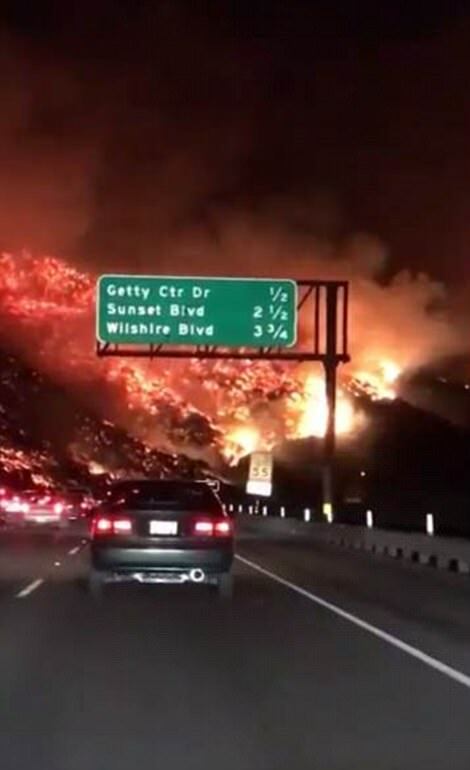 • Fire and smoke forced the closing of the 101 freeway — the main coastal route north from Los Angeles. More than 1,700 firefighters were working on the blaze there. • Hundreds of schools were ordered closed for the rest of the week because of the thick blanket of smoke filling the skies. • At the University of California at Los Angeles, officials said an electrical failure in the area left the campus without power. The student health center was distributing masks to students to help protect them from the smoke wafting over the campus. • Mr. Garcetti declared a local state of emergency because of the Skirball Fire, as the blaze in Bel-Air is called. Gov. Jerry Brown issued a similar call for the Ventura fire on Tuesday. The declarations asked for rapid aid from state and federal officials. Sam Grosslight, 24, of Bel-Air, was woken up by her mother, Carolyn, early Wednesday morning telling her to grab her phone and her computer. The family piled as much as they could, from Ms. Grosslight’s newly purchased makeup to her father’s ashes, into her Jeep. “People say you’ll know what you need when you get to the moment, but really you have no idea and you just start grabbing stuff and you’re all over the place,” Ms. Grosslight said. She stood at a highway overpass in her dad’s old red sweatshirt — Hell Freezes Over, it read — as plumes of smoke churned above her neighborhood. “It’s the weirdest feeling to not know when you can go back home again. That’s supposed to be the one place you can always go, and right now it’s just not,” she said. In 1961, a fire ripped through Bel-Air and destroyed almost 500 homes, including many belonging to celebrities, and prompted the adoption of new fire codes, including rules about clearing brush around buildings. His wife and daughter had filled the car with photographs. “That’s really all that really matters,” he said. Strong winds are normal, but it’s not usually this dry. Helping to spread the fires are the Santa Ana winds, which occur as cold, high-pressure air over Nevada and Utah descend into Southern California, accelerating and warming. Typically, Santa Ana conditions occur on roughly one-third of the days in December and January, Mr. Rolinski said. When the high winds last for just a day or two, Mr. Rolinski said, the region can often get by without a major fire starting and spreading. “But it’s hard to get through six days of this,” he said. The fire nears an iconic museum. To the west of the 405 freeway, the J. Paul Getty Museum in Los Angeles was closed to the public for a second day on Wednesday because of the wildfires, museum officials said. No artwork has been evacuated from the museum or its grounds, said Ron Hartwig, the museum’s vice president of communications, who added that the museum was designed to protect against natural disasters like wildfires. “The safest place for the art collection is right here in the Getty,” Mr. Hartwig said. He said he could see heavy smoke outside the museum coming from the fire area, and he was concerned about the homes across the freeway. “It is just very sad to see the fire across the street and realize so many of our neighbors are suffering,” he said. Jeff Hyland, the president of Hilton & Hyland in Beverly Hills and a 40-year veteran of the real estate market in Los Angeles, said he had a clear vantage point of the fire from his home on a hilltop in the Trousdale Estates neighborhood, and was watching helicopters drop water onto several properties in Bel-Air. The Bel-Air homes engulfed by the fires, he said, are mostly older homes on smaller, hillside lots. Some of the houses were built more than 30 years ago and likely would not have fire-resistant ceramic-shingle roofs that are up to modern fire codes, he said. Still, even the smallest vacant lot in the area would fetch over $1 million. The evacuation zone includes some extremely pricey areas, however, including one of Mr. Hyland’s listings currently on the market for $17 million. A family loses their home in Ventura. After years of his family renting in the area where they long dreamed of owning a home, Bryan Gonzales was finally able to buy his wife and seven children a house in Ventura in April. “My grandfather was born here,” he said. His house — a cream-colored, single-story building with blue trim — had three bedrooms and an addition where Mr. Gonzales kept his surfboards. By Wednesday, it was clear that the home had been completely destroyed, burned to the foundation, even though the houses on either side of the property remained standing. Mr. Gonzales described a smoke-filled sky with solitary chimneys rising among the ashes. “Everything is gone. There’s nothing left there,” he said. An earlier version of this article described incorrectly the relative location of a large fire threatening the city of Ventura, Calif. The fire is 40 miles to the northwest of another fire threatening Los Angeles, not to the northeast. Jennifer Medina reported from Los Angeles, and Richard Pérez-Peña from New York. Reporting was contributed by Mark Storer from Ventura, Calif.; Henry Fountain, Graham Bowley and Matt Stevens from New York; Candace Jackson from Oakland, Calif.; Mitch Smith from Chicago; and Louis Keene from Los Angeles.